The Corn Laws had protected landowners by shielding grains produced domestically against foreign competition through high tariffs. It took the arguments of great economists such as David Ricardo and those who followed him to overturn a longstanding belief in mercantilism, which advocated that countries achieve trade surpluses – including through protectionism. By working with the opposition Whigs, Sir Robert Peel was able to repeal the Corn Laws even with a divided Conservative party. There are echoes of history here too: current Prime Minister Theresa May also needs to work with the opposition Labour party to secure passage of her Brexit withdrawal agreement by the newly extended Brexit deadline day of 31 October. The repeal of the Corn Laws in the mid-19th century heralded a period of globalization that accompanied the rising prosperity of industrializing Britain. It led to the first ever free-trade agreement between the UK and France, signed in 1860, which was designed to commercially connect these previously warring nations. But it split the Tories. Sir Robert Peel’s tenure as prime minister ended shortly after the repeal of the Corn Laws. His party split when dissenters joined with the Whigs. 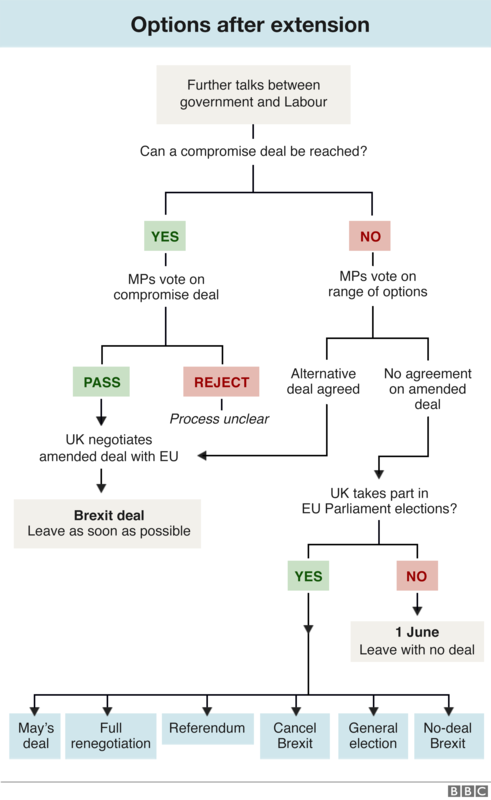 A flowchart showing Britain's options after extending the Brexit deadline to 31 October. Prime Minister Theresa May has already conceded that her premiership will end when her Brexit withdrawal agreement is passed by parliament. Her attempt to forge a deal with Jeremy Corbyn’s Labour party is deepening divisions within her party, since the opposition’s preferred Brexit outcome is a customs agreement with the EU. It would go some way towards resolving the hard Irish border – the sticking point in the prime minister’s Brexit agreement, which has led to its defeat three times in the Commons. But by sharing a common external tariff, Britain wouldn’t be able to do its own trade deals, a significant benefit in terms of setting the UK’s own economic policy. Labour’s proposal would be for the UK to have an advisory role in the EU’s international trade agreements. Whether that is feasible is still to be negotiated, but French President Emmanuel Macron has stated his opposition already. Facing a split: Theresa May's Tory cabinet in parliament. 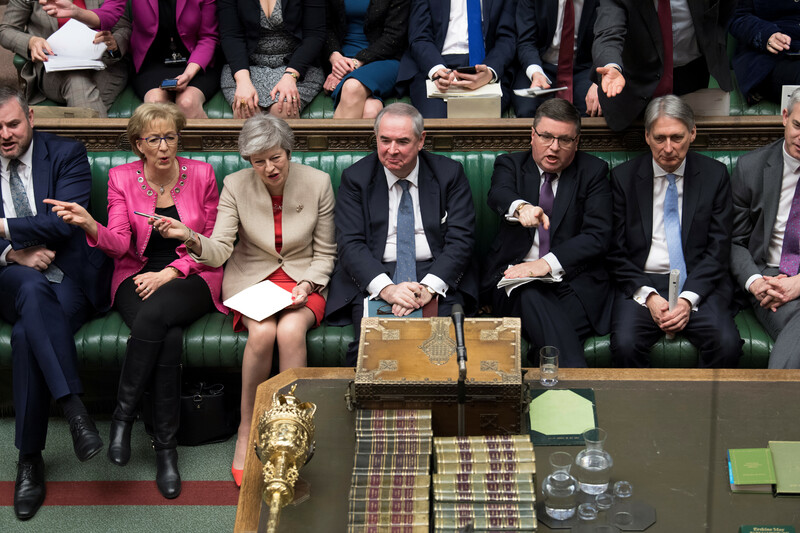 As the two sets of indicative votes taken by parliament have not revealed a majority for an alternative Brexit deal, and since the “no deal” option has been ruled out by MPs, a Conservative-Labour agreement is an attempt to craft a deal that can garner support. But if this deal includes the customs agreement, is it possible that any splits within the Conservative party will deepen further? There are Tories who favour leaving with no deal, and so removing Britain’s ability to conduct its own trade agreements may lead to controversy reminiscent of the 19th century, when the Corn Laws generated such rancorous divisions. After all, for Britain to leave the European Union in an orderly fashion will require a withdrawal agreement. The prime minister is attempting to bring this about. But it may well cost the Conservatives.